Hanoi capital is beautiful and famous with fragrance milk flower in the ancient streets, with the shimmering lake and the food has gone into legend. Pho is one of the legendary beauty and pride of Hanoi past and present. 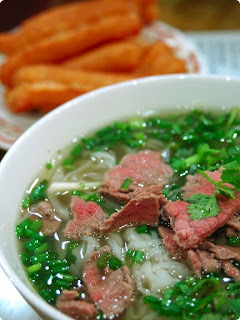 Hanoi’s food has many, but to consider food of Hanoi then one consider the first is Pho. 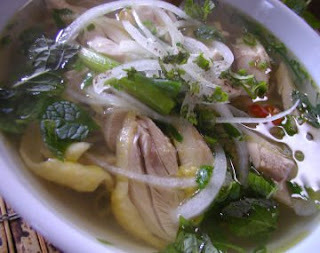 Pho as a representative of the character, specific of Hanoi food. The simple reason, Hanoi Pho is different with other place, it can not be mixed with Pho in somewhere, even there we have to promote Pho of Hanoi. Pho is used as breakfast or lunch and dinner, not eat with other dishes. Stock of Pho are made of cows bones. Meat can be used for pho is beef or chicken. Noodles are must thin and soft. Spice of Pho is green onion, pepper, vinegar peppers, lemon slices. Hot Pho eat delicious, Hanoi people eat with Quay. However, to get the bowl of tasty noodles depending on experience and traditional secret of cooking Pho. Pho Hanoi with the fresh sweet of legs bones of cows, the perfume of beef meat has just cooked flexible but not tough. Color of Pho water is clear , noodle of Pho is flat and soft. Just look at the bowl of Pho only enough to see the trendy, care in way of eating of Hanoi people. Some Pho noodleboil hot water through soft arrange are in bow, the meat in thin slices as silk above, some tender small spring onion, blade of dill , some yellow slice of ginger as silk add more red slice of peppers. All things create a beautiful picture on the table of customers. All that color as a solid form picture with beautiful color, fragrant smell stick to the hot water of Pho, exhale strongly, everything rouse ability taste, smell of food, we can make sense of being entitled to a fine of God and the people again. Only a little drinking water make to be of sound mind. Meat is soft, cake is flexible, sometimes to see the soft poignant by ginger and hot of peppers, the gently fragrant of vegetables, the perfume of fresh soft beef . All many things are very tasty, a sweet in a good-natured, soft light that truthfulness, the great harmony. Pho Hanoi is so, it is delicious of all the materials of Vietnam, but the hands of the Hanoi make to the famous work!